Delineates the steps required to place a saved advanced query on the dashboard. For specialized queries you want to maintain on your dashboard, you will need to create the query and then follow the steps below. In this way the query will be constantly visible and “refreshing” at whatever rate you have set in your Dashboard setup. These can become addictive and lead to more and more dashboards. Create thesystem_setup_ch_2-machine_setup you wish to maintain on your dashboard, if you have not already done so. This is done through the Advanced Query builder accessible from Explorer or from the Advanced Query Setup tab in the Marketing Home tab. The Screen Shot below shows the setup for the Query used in this example. Be aware of whether your Query in an Company, Estimate, Order type and be sure it is saved in one of those categories. The example below assumes you are placing an “Order” query on the dashboard. However, the steps will be the same for the other types. Bring up the Dashboard on which you wish to place your query. Click on Add Instrument and then click on Marketing and Advanced Explorer Instruments to bring up the list of “marketing” dashboard choices. Select Marketing Search Results. The Marketing Search results selection will cause a panel to be placed on your dashboard. Select Edit from that panel. This will open a new panel with 3 radio buttons. Click on the bottom or 3rd button down and be sure Order is selected. Next click on the second button down and you will get a list of all the saved queries in the Order category. Select the query you wish to monitor on your dashboard. 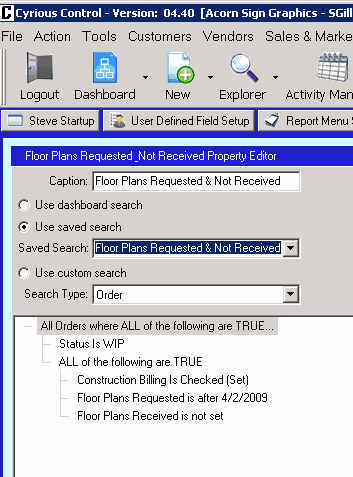 The example below shows the complete setup for the Query “Floor Plans Requested & Not Received” . Enter the name of this report in the text box at the top of the form and them click on the “X” at the far right to close the form. Be careful not to click on the “x” for the dashboard or you will have to start all over again. These selections will cause your report to appear on the dashboard. You can then select the Column Chooser by left clicking within the Explorer panel and select and arrange the fields as you want them to appear. Note that if you want to include UDF fields in your report, you will need to click on the “Add Custom Columns” link in the Column Chooser which will bring up a list of all UDFs The Screen Shot below shows this link. Check the one(s) you want and they will appear in the report. Note that you can edit your advanced query at any time and any changes you make will be reflected in your report at the next Refresh. Click on lock at the top of the dashboard to prevent inadvertent closing of the dashboard and other unwanted surprises. If you want your Dashboard to be available to all Users, click the Share tab. It will then appear in the Tools/Dashboards drop down list of all the Users in your system. Click “Save” or “Save As” if this is a new Dashboard and save your work.